When accessed on a mobile device, enterprise data is susceptible to leakage, tampering, hacker attacks and transmission to unknown destinations. Due to the nature of the information dealt with in the healthcare industry, loss of such data can have severe consequences for the organization, the caregivers in its employ as well as the patients in its care. Whether it be a doctor accessing a back-end hospital portal for patient information, an administrator uploading their notes from an important budgeting meeting or a researcher posting results from an important study, it is critically important that the security and protection of sensitive hospital and clinical data be at the forefront of concern. 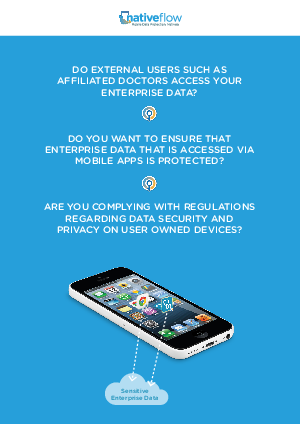 Download the solution brief to learn more about protecting your organization’s enterprise data.